Wearing your hair pulled back in a ponytail every day is a signal that you need a makeover. Change brings with it a set of challenges, especially when it comes to changing the way you look. You may be concerned that if you get a new hairstyle or try a new kind of makeup, you won’t like the way you look. Many people find changing their physical appearance brings them a fresh outlook and new perspective, though. Here are five signs you’re due for a total makeover. While many people take this statement as a compliment, consider the flip side. It may be time to change up your look. If you’re wearing the same style of clothing, the same haircut, and the same makeup you wore in high school or college, you haven’t changed, but it’s time you did. Feeling a little apprehensive? Have a live psychic reading to determine if it’s a good time to bring about change in your life. 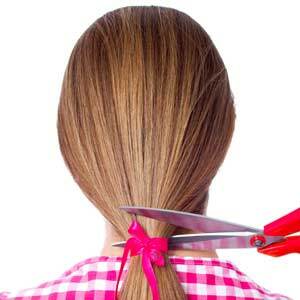 Women with longer hair know the convenience of being able to pull it into a quick ponytail. If that’s your go-to move every single day, however, you definitely need to think about a complete makeover that starts with your hair. Typically, women pull back their hair because it lacks volume and a style. So, wearing your hair back may indicate that you don’t feel good about how it feels when it's worn down. In addition to a fashionable cut, check out the season’s hottest hair colors to give your tresses a complete makeover. Clothes need to make you feel good about yourself. If your closet doesn’t offer more than a couple of eye-catching items, it’s probably time to hit the mall or even your favorite thrift store. Dressing fashionably boosts your confidence and shows you’re willing to stay current on the latest styles. Ditch the old, drab clothes you’ve had for years and pick out some fun pieces to amp up your wardrobe. Don’t be afraid to include in your total makeover some new pieces of jewelry, since new accessories enhance the new overlook you hope to achieve. If you find yourself hungry for change, then go with that feeling and give yourself a total makeover. Besides buying a couple of new outfits and getting a new haircut, consider having your nails done and letting a professional at a makeup counter show you how to improve your application technique. A restless feeling paves the way to make big changes in how you look, which also impacts how you feel. Not feeling so great about yourself lately? Allowing yourself to have a complete makeover is an ideal way to feel better about yourself. A new haircut or color, new clothes, and fresh makeup build your confidence every time you look in the mirror. And you can bet other people will notice the changes and offer encouragement as well. Don’t be afraid to get an outside opinion on what kind of makeover is best for you. Your friends and family may have some suggestions. Authentic psychics offer perspective on whether or not you’re changing for the right reasons.